Motivation implies the process of encouraging people to act in order to attain the desired objectives. It is something that stimulates an individual to keep doing the act already initiated. In this context, Abraham Maslow, a renowned psychologist, highlighted the elements of the theory of motivation, in a classic paper released in 1943. His theory is based on human needs and its fulfilment. On the other hand, Frederick Herzberg is an American psychologist, who coined out the concept of job enrichment and two-factor theory on motivation based on rewards and incentives. He attempted to shed more light on the concept of work motivation. Check out this article to know the differences between Maslow and Herzberg’s theory on motivation. Meaning Maslow's Theory is a general theory on motivation which states that the urge to satisfy needs is the most important factor in motivation. Herzberg's Theory on motivation says that there are various factors existing at the workplace that causes job satisfaction or dissatisfaction. Core concept Unsatisfied needs stimulate individuals. Gratified needs regulate behavior and performance. Division Growth and deficiency needs. Hygiene and motivator factors. Abraham Maslow is an Americal psychologist, who introduced the popular ‘Need hierarchy theory’ on motivation. The theory emphasizes the urge to satisfy needs of people working in the organization. The theory is divided into two categories, i.e. growth needs and deficiency needs, which are further subclassified into five needs, within each individual, represented in the shape of a pyramid. The theory is based on the premise that human needs are in proper sequence, wherein psychological need is at the bottom, and self-actualisation needs are at the top level. Other needs, i.e. safety needs, social needs and esteem needs are in the middle. It infers that higher level needs cannot evolve until the lower level needs are not satisfied. As the needs of human beings are unlimited, whenever one need is satisfied, another need take its place. Moreover, an unsatisfied need is the motivator which governs the behaviour of the individual. Frederick Herzberg is a behavioural scientist, who developed a theory in the year 1959 called as the two-factor theory on motivation or motivation-hygiene theory. Herzberg and his associates carried out interviews of 200 persons including engineers and accountants. In that survey, they were asked about the components of job that make them happy or unhappy, and their answers made it clear that it was the working environment that causes unhappiness or dissatisfaction. As per the theory, hygiene factors, are essential to keep a reasonable level of satisfaction among employees. Such factors do not actually result in satisfaction, but their absence causes dissatisfaction, that is why, they are known as dissatisfiers. Secondly, motivational factors are inherent to the job, and so the increase in these factors will lead to the rise in the satisfaction level, while the decrease does not cause dissatisfaction in employees. Maslow’s Theory is a general theory of motivation which expresses that the urge to satisfy needs is the principle variable in motivation. In contrast, Herzberg’s Theory on motivation reveals that there are some variables existing at the workplace that results in job satisfaction or dissatisfaction. Maslow’s theory is descriptive, whereas the theory propounded by Herzberg is simple and prescriptive. 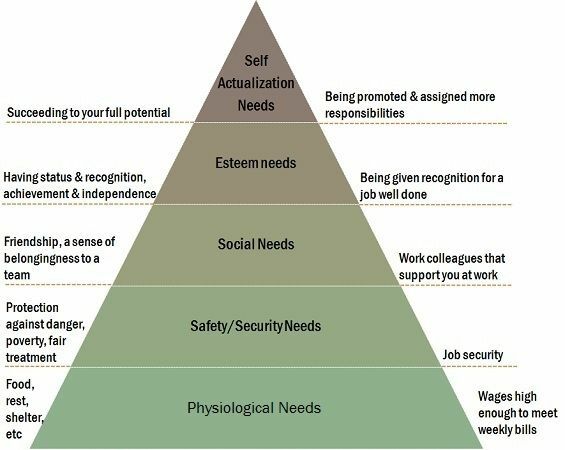 The basis of Maslow’s theory is human needs and their satisfaction. On the other hand, the Herzberg’s theory relies on reward and recognition. In Maslow’s theory, there is a proper sequence of needs from lower to higher. Conversely, no such sequence exists in the case of Herzberg’s theory. Maslow’s theory states that unsatisfied needs of an individual act as the stimulator. As against, Herberg’s theory reveals that gratified needs govern the behaviour and performance of an individual. The needs of an individual are divided into two categories i.e. survival/deficiency needs and growth needs as per Maslow. On the contrary, in Herzberg’s model, the needs of an individual are classified into Hygiene and motivator factors. In Maslow’s theory, any unsatisfied need of an individual serves as the motivator. Unlike in the case of Herzberg, only higher level needs are counted as the motivator. The two models developed by the two experts aims at simplifying the motivational process which proved that motivation is an important factor to improve the performance level of employees. Herzberg’s theory is an addition to the Maslow’s theory. These are not contradictory but complementary to one another. I really appreciate this article. very useful.